Chihuahua Maltese puppies are awesome. Ours is 5 months old & is as lively as you can imagine!! We named her after the fairy in the movie, "Legend" with Tom Cruise & Tim Curry. She is under 4 lbs. right now. She is so adorable, playful, cuddly, loves to wrestle with the cat,(who puts her in a head lock). Our Chihuahua Maltese puppu is white & cream, with crazy fur!!! Hence the name, Google Oona & you'll see what I mean. Our puppy looks like Oona but his ears flop down and has a curly tail.He's very lively,loves biting toes,stubborn and quite difficult to train.But we love our Rex nevertheless.And he's absolutely spoilt. Oona is soooo adorable! Oona is the same exact breed! as my Malchi!!! (That's what they call Maltese/Chihuahua Mix)!! Oona looks like my Princess, but tiny! They are the BEST dog I have ever had. Playful and so loving. They are possessive over their people! Especially when ONE person is their MAIN heart! I got one of the tiniest Chihuahua Maltese puppies, Belladonna, from a young couple that had to move back in with parents and the parents didn't want the 3 week old litter in their house. She was born around February 1, 2010. It was still cold out, so they gave them away at 3 weeks old. Her eyes were barely opened and she had no teeth yet! She is precious! I tried bottle feeding but she did better with a eye dropper. I fed her puppy formula, then added some pkg food a few weeks later. She is doing great and is the Queen of this house! I have two other dogs older than her and she has no problem taking them on! She does have a very aggressive disposition. I have never seen a pup this aggressive! 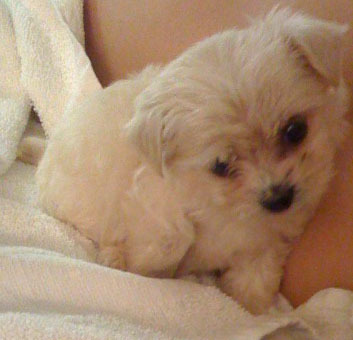 My Chihuahua Maltese puppy is adorable and very loved. I only wish now I would have taken more of the pups! She prances around the house likes she owns it. She is such a beautiful itty-bitty. Part of your aggression behaviours stem from the early age she was taken from her mother. Poor itty-bitty belladona does not even know she is a dog. Her "Napolean Complex" will need to be worked with for proper balance in your home. She is blessed to have such a caring mom! Good Luck! Belladonna, will own the house & be the boss as being the smallest means nothing. They think they are a big dog. You are very luckly. And so is she. Hi! 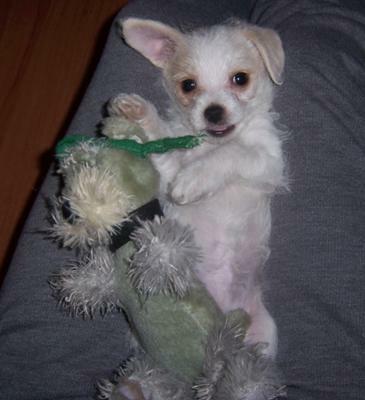 My name is Bijoux and I'm one of the cutest 3 month old Chihuahua Maltese puppies. I only weigh 1.5 lbs but I love to eat. I'm a ball of energy and can play for 22 hours a day! I would definitely say that I'm a great bundle of Chihuahua Maltese puppy joy... and terror, all in one! Charlie is one of the sweetest Chihuahua Maltese puppies. Very mild tempered, very loyal, and very smart. I got him at 6 weeks and he doesn't tear up anything and is pretty easy to train. My family and I never had a dog growing up, but once our Chihuahua Maltese was introduced to the family, we instantly loved Charlie! Despite LOVING the name Charley (Charlie) having named my nephewdog that name...Your baby angel should be called Rocky for Rocky the raccoon which is what he looks like!! he is a baby angel baby raccoon - please update me as he grows - he goes in the SAVE pile of about 5 or so dogs from this site - Cosette was another but have since lost touch with her owner - she turned out to be my neighbor in NYC - your baby raccoon malchi is so adorable he is an award winner!! 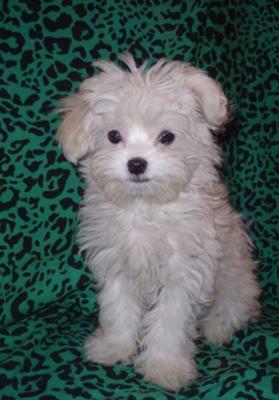 I got my Malti-chi puppy Violet as a birthday present, and we had to drive 2 hours to get her! She is the best puppy I have ever had. 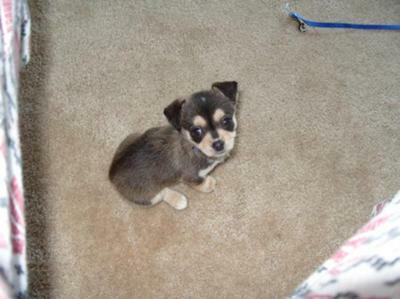 When I got her she was about 7 weeks and weighing only about 1 pound, if that. She is pretty good at the whole potty training thing, if she has to go to wines at the door which I think is very good for a 10 week old. She only has a few accidents here and there, but she has such a small bladder. She is obsessed with my other dog London, and wants to wrestle with her constantly. She is definitely a lab dog and wines if nobody is paying attention to her, but that's ok because I love giving her attention. My Malti-chi will be a part of my family for a long time. 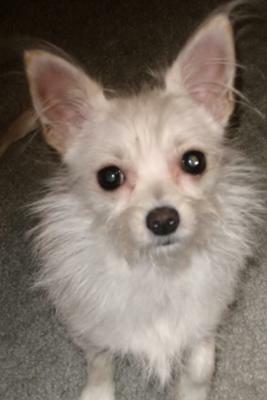 My name is gizmo and i am a year old maltese-chihuahua mix. I am looking for a girlfriend, but my people are having a hard time finding a breeder besides where they got me. They are willing to drive wherever they need to to get my mate! any help would be appreciated! She needs to be a maltese-chihuahua mix, just like me. Two Paws UP! for Violet! Did your puppy come from Oklahoma? I am looking at a litter from there now, and they look awfully similar! If your puppy did come from there, can you email me? I would like to get your thoughts and opinions now!!! 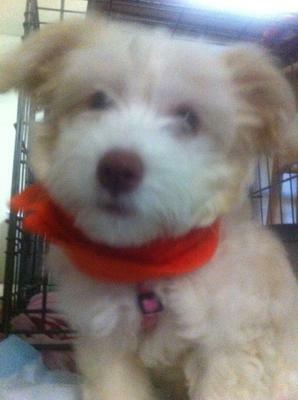 We recvd this dog and the girl told us she was 3 months old Maltese Chihuahua mix puppy, but wasn't really sure. What do you guys think, is bella a Malchi? 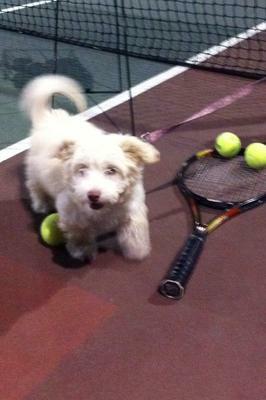 Bella can learn tricks really fast, maybe 2 sessions of training and she has it down pat. Although, but potty training is turning out to be a little tough. She still has her pink nose for now, I should be changing to black soon. I wasn't sure how a Malchi would get along with the family but this pretty little girl has wrapped us all around her tiny paw. I can't imagine life without my Daisy now! Daisy is one of the most lovable, playful Chihuahua Maltese puppies I have ever owned. She loves to be around people of all ages. She does love kids especially though. She will follow them everywhere they go trying to do whatever they do. She loves her momma which is me. She has to be everywhere I am and she never runs out of kisses for me either. She is such a sweet adorable Chihuahua Maltese puppy. She is white with a cream line that runs down her back. Her hair isn't long, nor is it short. Her longest hair is around her neck and on her face. The only word to explain her is a-d-o-r-a-b-l-e!!!! 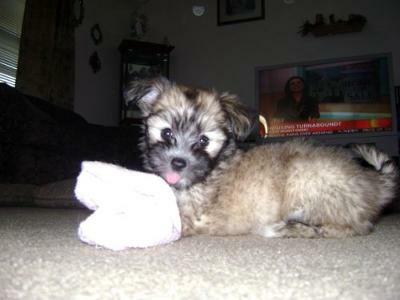 Daisy's very cute, and resembles our 2and 1/2 yr old, Gizmo! You'll find these breeds are the best, most lovable companions- have fun! 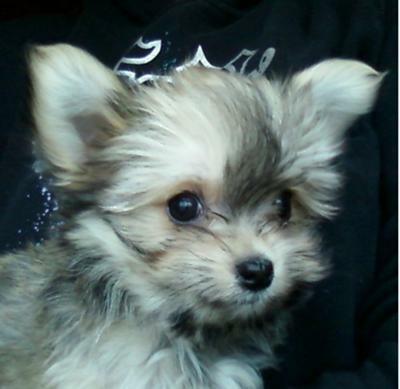 Lois Lacey is one of the cutest 10 week old Chihuahua Maltese puppies and terrorizes our 4 yr old lab and 10 yr old cat. She loves to play and brings all of her toys to the center of the room. She likes to be feed holding the Eukanuba small breed food in my hands, she carefully eats one or two little pieces at a time. Our Chihuahua Maltese gets car sick whenever we take her with us. She does not like to go potty outside when the grass is wet. Lois is always ready to take a nap and lie beside me. At bedtime she sleeps in her crate on a cozy blanket. When she gets up, she immediately is carried to the door and goes both pee and poop then comes in on her own. Our Malchi puppy loves our grandsons (all 3 under 5) and runs and plays along side of them. She gets so excited when they come to visit. Hi! our little malchi, Gizmo is 2 yrs old and such a little joy. He, too, likes to be fed his little doggie nuggets to him one at a time, but does love his Ceasar's moist food, too! Something they have in common is that our Gizmo doesn't like to go out on the wet grass either...he does this little funky leg twitch, like he's trying not to actually touch the wet ground with his paws! It's tough not to laugh. I love Chihuahua Maltese puppies. Toby is 4 months old and weighs a big 3.1 lbs. He is VERY smart: Potty trained, comes to his name, and even recognizes toys when asked to retrieve them. My Chihuahua Maltese is also inquisitive, needs to know what every sound in the house is, and who or what's making it. He enjoys human company very much, and is always ready to play or cuddle with us. He's got one bad habit, he pulls on the loops on the throw rugs. Toby looks exactly like my little guy Buddy! Buddy is 12 weeks old and weighs a whopping 2.3 lbs. I love this brred, they are so smart and funny! I've had my Maltese Chihuahua puppy Little Bear for 8 days now. He still doesn't quite understand what his name is nor does he understand when impounce on the floor on all four infront of him I'm only playing, not trying to hurt him... He already knows not to go to the bathroom on furniture, but he likes going on the carpet right now. He's very quiet and loves to cuddle. If he doesn't have someone in view, he'll start barking though, so I keep him in his kennel on my bed. He stays up for hours banging his head on the door and barking if I try going the night without him... He is also scared of heights... But I can't blame him when he is only like 5 inches tall. I still love him a whole lot! He was totally worth the money I paid for him! 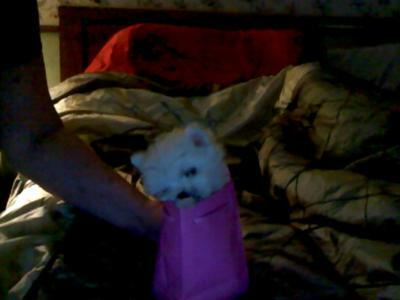 If you live in Missouri, check out this website: http://www.k9kabin.com/ That is where I bought my Maltese Chihuahua puppy Little Bear. Lex and his wife are very professional, caring, helpful and nice. This is Leon the most vibrant, loving and loyal of all Chihuahua Maltese puppies. Who loves to play and always be by your side. He can be a little bit nippy when he gets excited but that's just because he gets a little overwhelmed with lots of family around and is pooped out from all the love he is acquiring. Your pup doesn't look at all like either Chihuahua or Maltese. Have you tried a DNA kit from petsmart? I'm willing to bet your baby is a miniature pinscher. What a little beauty! However, I bet your dog is part miniature pinscher. 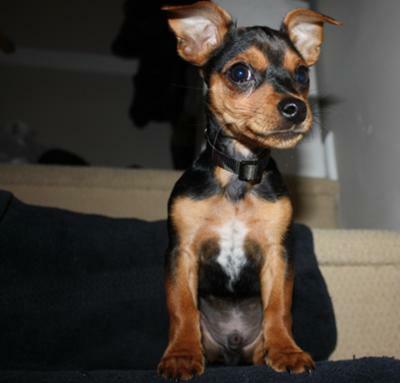 His markings and coloring are exactly like that of a min-pin. Regardless, he's precious! what a cute dog enjoy him I am sure you do! This is our baby Pep. She is 7 weeks old and one of the cutest Chihuahua Maltese puppies. She is lively, lovable, cuddly, adorable and my husband and I LOVE HER!!!! She's been biting a lot and likes to get her own way so I've had to be really firm with her. She was mat trained in 2 days and I'm still shocked at just how switched on she is. The first week or so she was up yelping and crying every hour of the night, 2am, 3am, 4am, 5am. I stupidly keep going downstairs to stay with her. Worst mistake! I realised that I shouldn't be doing that so my husband and I had about 3 sleepless nights sleep and now she sleeps through. She still hates it when I leave her but she gets up and starts talking now at 6am. 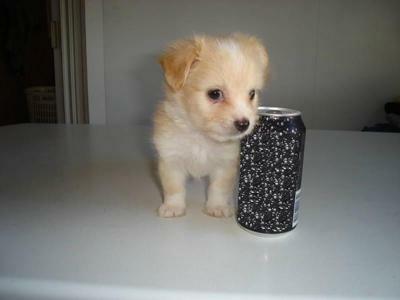 I'm wondering how big my Malchi puppy will get?! We love her so much! Best thing that we've ever done and she makes our house so happy!